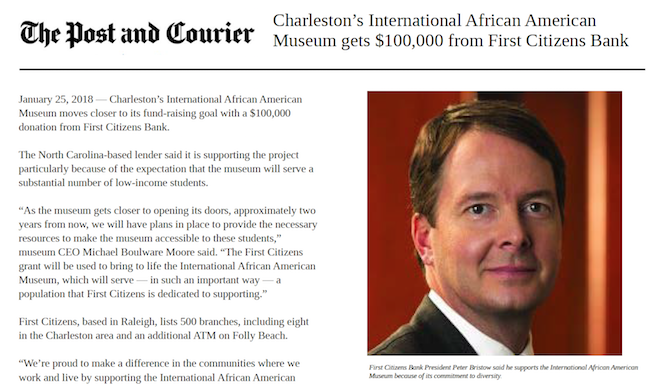 First Citizens Bank has generously donated $100,000 in the International African American Museum (IAAM), which is slated to break ground later this year. For more than a century, First Citizens has successfully served its customers while adhering to its fundamental values of “working hard, working with integrity, listening to what its customers have to say and taking the long-term view.” The bank is also deeply committed to diversity, which fortifies our communities and our society as a whole. First Citizens is particularly interested in supporting low-income students, and providing them with enrichment opportunities. The IAAM’s projections include a substantial number of low-income students who are eligible for reduced-price and free meals.